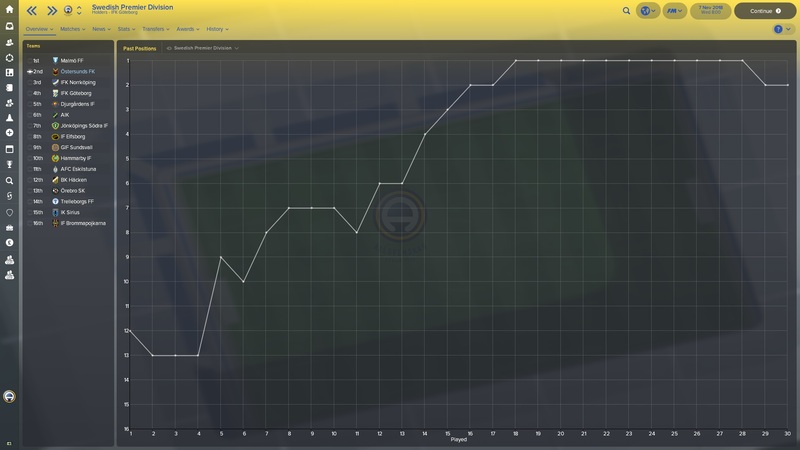 In our second season with Ostersunds FK, the Swedish side currently taking the Europa League by storm in real-life, we’ve had a lot of fun. After completing our latest season, I will be writing four posts on various topics. This post will be our season review where I’ll look at our season and how we’ve performed in 2018. Below you can see the four posts that I’ll be writing in the coming days/weeks. I’d also like to point you towards my Twitter: @VivaLaVidaFM. This is where I share updates on my Ostersund save along with other Football Manager related tweets. Anyway, let’s get on with our Season Two review with Ostersund and find out how our Swedish manager Oscar Friberg has performed with the club. The format of the Swedish Cup is an interesting one. The 2nd Round (and the first in which Ostersund are entered into) takes place in August. The winner progresses through to a group stage which takes place the following February before the beginning of the next league season. There are eight groups with the winners from each group progresses through to the Quarter-Finals. We topped our cup group comfortably, winning all three games against three second-tier Swedish sides. This meant that we would progress through to the Quarter Final where we were drawn against another team in the division below, Dalkurd. We headed into this game expecting victory. Oscar Friberg was planning for the semifinals where his team could be drawn against Malmo or Goteborg. This complacency ended our Swedish Cup campaign. We lost 1-0 to Dalkurd and crashed out of the Cup, meaning that there would be no European football in the 2018-19 season. In more positive news, we have gone through to the 2019 Swedish Cup group stages after beating Lunds BK 4-2. 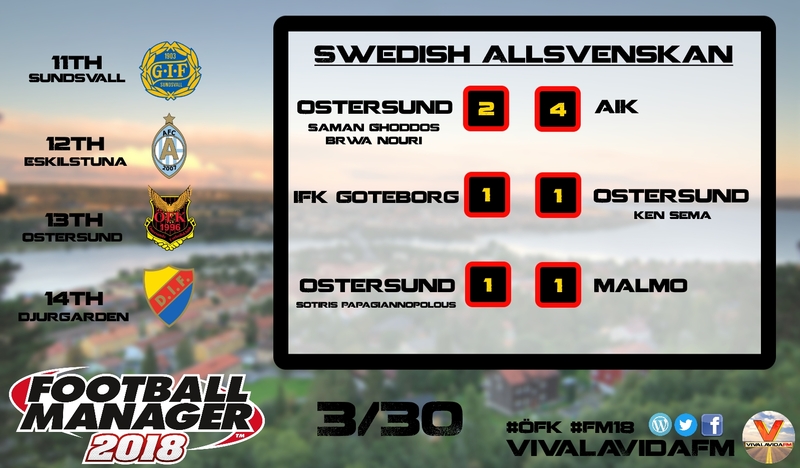 After being winless in our first four league games, many could have questioned Oscar Friberg’s side. But three draws against Goteborg, Malmo and Elfsborg, plus a defeat against AIK, is nothing to be scoffed at. Predicted to finish below all four of these sides shows how good some of our performances were. From here, we went on to win 7 of our next 10 games. This run of form saw us rise to 4th in the league before the summer break in which the 2018 World Cup would take place. Upon our return, we continued our good form. 10 wins from 16 league games is an impressive run of form for a side predicted to finish 8th. Six points separate champions Malmo and us in second. It would be easy to look back on our penultimate match of the season where we lost 1-0 to Malmo. A win there would have seen us win the league on goal-difference. But in truth Malmo were too strong. They won their final 8 league games to end our aspirations of an incredible league title. We led the league for eleven game-weeks but lost out to Swedish giants Malmo. 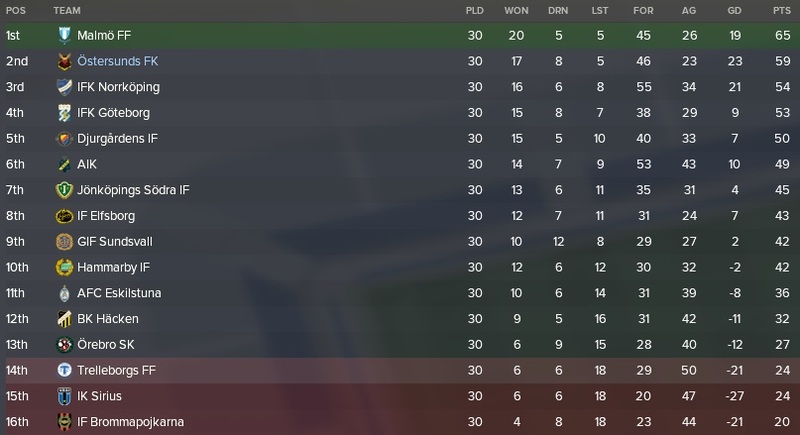 Having come so close to victory in only our second league campaign with Ostersund, I want to win the league with them. 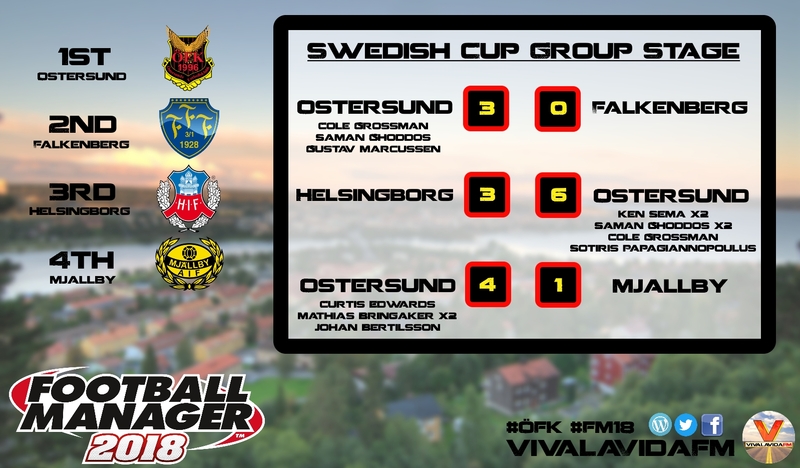 Ostersund, in real-life, have made the Europa League 2018 knockout rounds. My aim is just to reach the group stages! Thank you very much for reading another instalment of our Football Manager 2018 story here on VivaLaVidaFM.